Looking back over the last fifteen years and seeing just how far Christopher Nolan’s career has come – from shooting a low-budget thriller with his mates in London to fiddling around with $165m – is pretty incredible. With wildly ambitious and interesting films like Memento, The Prestige and Inception, he’s deftly established himself among the ranks of directors like Paul Thomas Anderson, Quentin Tarantino and Matthew Vaughn who, despite personal opinion, will always do something unique and uncompromising, while in between showing off his blockbusting ability with the gritty, realistic take on The Dark Knight that has pretty much afforded him the chance to play around with so many of those dollars. But that rise to prominence, where each passing film tends to be the biggest release of the year, has brought with it extraordinary levels of expectation with the potential to hurt films; probably none more so than the galaxy-traversing, science-spinning Interstellar. Nolan’s time-bending space opera is undoubtedly an epic on many levels, from a star-studded cast to sweeping visuals to expansive ideas, and deserves to carry with it an air of anticipation following the spectacle on offer in the likes of Inception and The Dark Knight, yet it’s imperative not to go into this film expecting to see either. If Interstellar experiences a downfall, it may well stem from some form of typecasting; this is not a film based around set-pieces or spectacle, but one based around the interpretation of ideas, like looking deeply into a painting instead of switching on the TV. It shares more in common with Kubrick’s 2001 – cited by Nolan as a direct influence – than anything else, delivering on its promise of being an experience, but subverting expectations every step of the way to do so. Like all great science fiction, Interstellar first and foremost devotes itself to challenging its audience with ideas. While outwardly the story of Earth running out of resources, forcing farmer and father of two, Cooper (McConaughey), through perhaps contrived circumstances, to pilot a ship through a mysteriously placed wormhole near Saturn to find inhabitable worlds in new galaxies, the film gradually opens up into a sprawling, time-spanning cluster of questions: Is time linear? What power does love really hold in the universe? Is science the answer to all our questions? Whether those questions are answered or not, there’s something enormously refreshing about a huge, multimillion dollar space movie being so willing to stick to its principles and not succumb to ill-conceived, studio-pressured set-pieces – particularly with a running time closing on three hours. The film certainly isn’t devoid of spectacle or the odd nail-biting sequence – a race to escape an impending two hundred foot wave on a foreign planet provides the biggest thrill – but it never wants to make that the focus. It wants us to walk out pondering what the perplexing, five dimentional third act means, not gasp about a rotating hallway or a twenty car downtown chase. Make of that what you will, but there’s a reason Nolan has become one of those aforementioned ‘particular’ directors; he will do things his way, regardless of who’s paying the bills. There’s a noticeably different look and feel to the visuals of Interstellar, with it being Nolan’s first film since Following without Wally Pfister as DoP, but it remains gorgeous to behold. The space travelling sequences lend themselves to a unique, sparkling beauty, while the expanse of the alien planets is captured with grace and skill. Perhaps Nolan’s reluctance to use CGI stretches just a little too far on occasion (a particular docking sequence looks a bit fake), but it pays dividends the rest of the time – particularly when we’re inside the ship. Nolan’s meticulous crafting of every single frame gives a real personality to the Endurance, a sense of isolation and claustrophobia, whereby we really believe they’re trapped in a box in another galaxy and not just sitting in front of a fake background in some studio in LA. Much criticism is being thrown around at the science of travelling through black holes and the stretching of time, but every science fiction film will face similar problems, and it can hardly be said it affects the narrative. 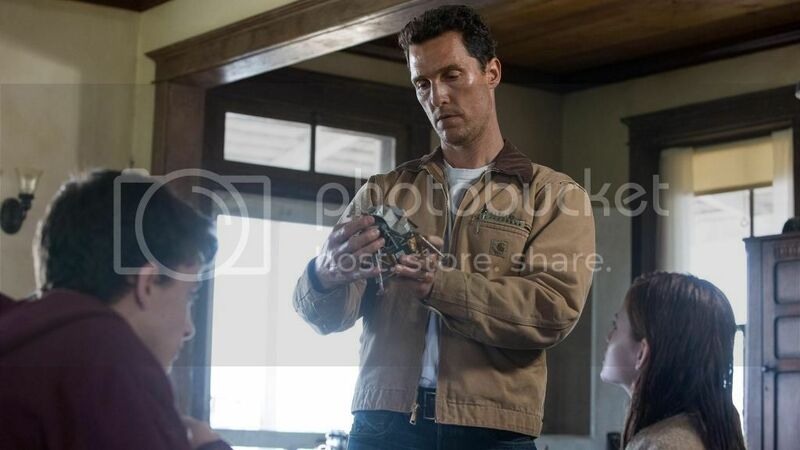 What’s more important is that with terrific performances (McConaughey continues to excel, Caine makes us cry again) and a gorgeously understated soundtrack (Zimmer’s usual bangs and crashes make way for soft notes and ethereal thrums to complement the cerebrating nature of the drama), Interstellar is a big, bold and beautiful triumph on many, if not all, levels. It discusses reality, questions time and celebrates love, with a engaging character at the centre who, while less complicated than many of Nolan’s previous protagonists, carries with him across galaxies an enormous and compelling personal burden. This isn’t Nolan’s masterpiece, but while it may not yet be wholly understood, Interstellar is destined to go down as one of the great science fiction films of its time.